Heat oven to 375° F. From top to bottom, cut 1/4-inch slits across the top of each zucchini, with each going about 3/4 of the way through. 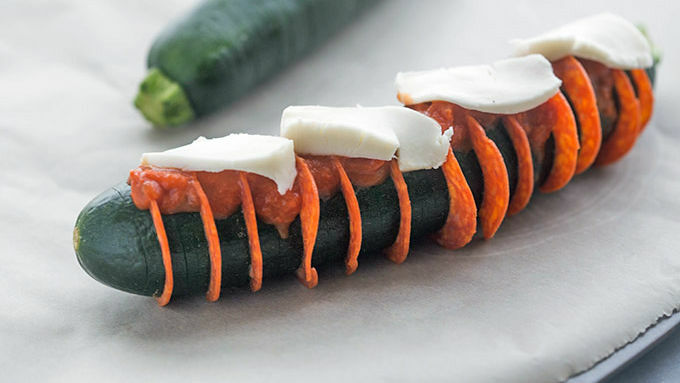 Gently bend zucchini back and slide pepperoni into several slits. 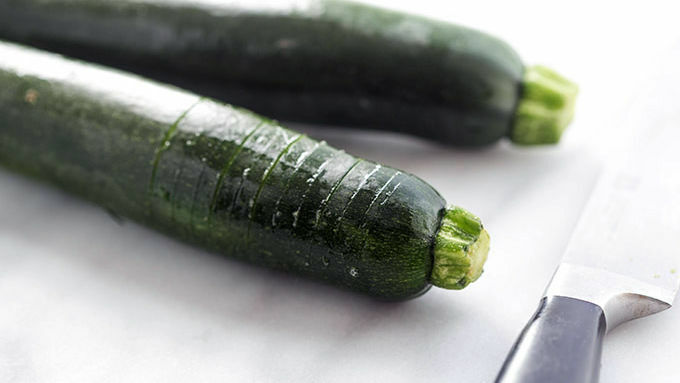 Place zucchini on a parchment-lined baking sheet. Spoon pasta sauce across top. Sprinkle with mozzarella. 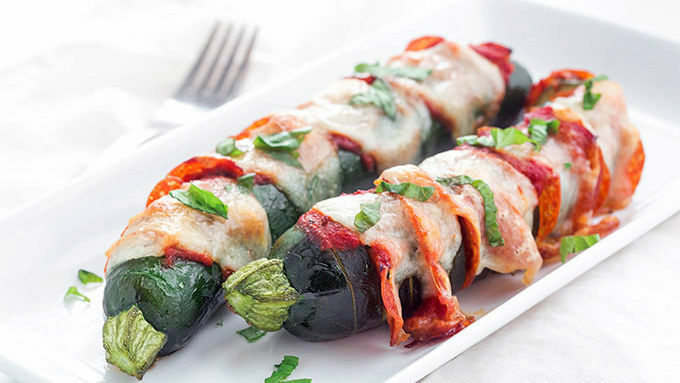 Bake for 35-40 minutes, or until zucchini is tender and cheese begins to brown slightly. Garnish with basil, if desired. Serve and enjoy! Quick and simple—perfect for lazy summer dinners! Spring is here! Time to pull out all of those gorgeous spring veggies! Corn, asparagus and zucchini—their season has come. 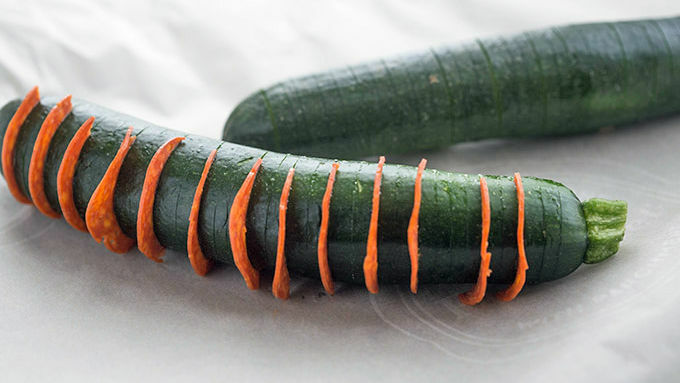 And we couldn’t be more delighted, because we’ve decided to make hasselback zucchini. Perhaps the most perfect side dish ever, we gave this one a twist—turning it into savory pizza baked slices! Prepare your forks. 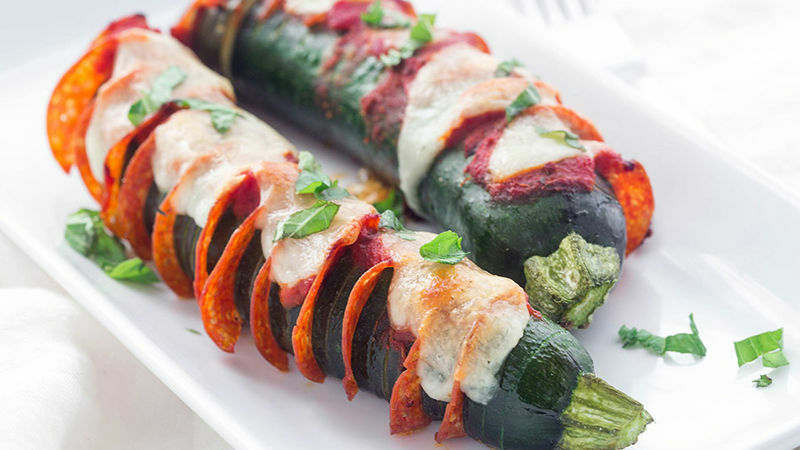 Hasselback Zucchini Pizza awaits! While we created this recipe as a side, it’s also the greatest quick and mellow vegetarian dinner dish ever! Whether you decide to serve it up as a side with chicken or roast or salad, or go the easy route and make this your main, whip this one up tonight. So easy and tasty, it’s a must-try keeper.